If you're serious about meat, this is the pellet grill for you. 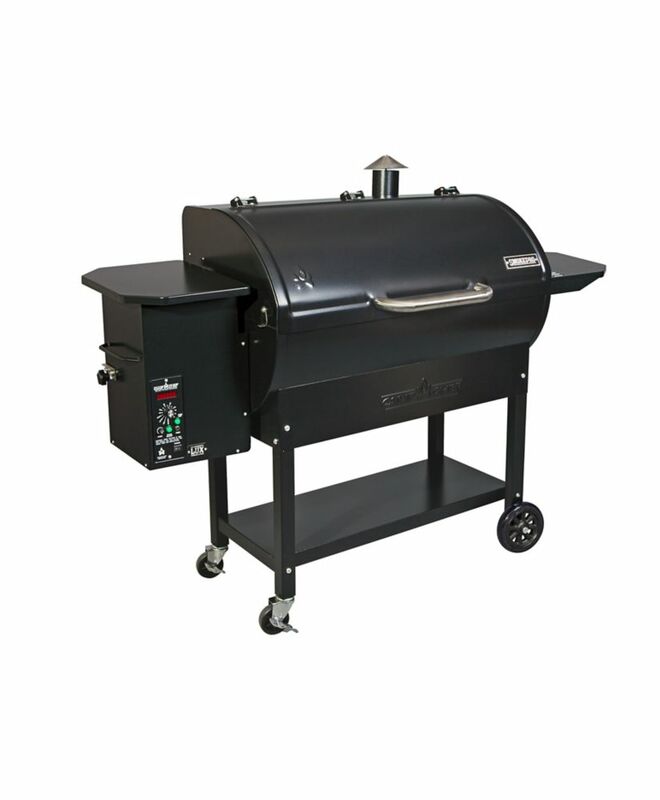 The SmokePro LUX Pellet Grill & Smoker has a whopping total of 875 square inches of cooking space for you to work with, giving you the room to cook anything and any quantity you need. We've kept all of the same great features for the home griller to simplify the smoking process, like a digital temperature display and a simple setting control panel. Let the grill do the work for you as the pellet auger feeds the perfect amount of wood to your fire box. Our Smart Smoke Technology ensures the maximum amount of smoke and, therefore, the best flavour around. Add to all this our exclusive ash cleanout system, and you're running out of reasons not to buy this pellet grill. It's time to break free from boring backyard grilling with the stainless steel Napoleon Rogue 425 Natural Gas Grill with Range Side Burner. You'll know it's a Napoleon with the iconic WAVE cooking grids for those distinctive sear marks. Three stainless steel burners produce precise heat and dual level stainless steel sear plates vaporize the drippings for intense flavor while you grill. Create culinary masterpieces on 425 square inches of main grilling area. Succulent sauces and sides are a snap with the integrated range side burner. This easy to maintain stainless steel grill has a single door with integrated storage that will blend beautifully with your outdoor decor. Locking casters in the pedestal base mean that this grill can be moved into the thick of the action. Folding stainless steel side shelves save space, allowing the Rogue to fit anywhere in your culinary landscape. No other grill gives you such versatility with an affordable price and high-quality components. SmokePro LUX Pellet Grill If you're serious about meat, this is the pellet grill for you. The SmokePro LUX Pellet Grill & Smoker has a whopping total of 875 square inches of cooking space for you to work with, giving you the room to cook anything and any quantity you need. We've kept all of the same great features for the home griller to simplify the smoking process, like a digital temperature display and a simple setting control panel. Let the grill do the work for you as the pellet auger feeds the perfect amount of wood to your fire box. Our Smart Smoke Technology ensures the maximum amount of smoke and, therefore, the best flavour around. Add to all this our exclusive ash cleanout system, and you're running out of reasons not to buy this pellet grill. SmokePro LUX Pellet Grill is rated 4.7 out of 5 by 52. Rated 5 out of 5 by ozzy from Very nice well built only used once but worked great I also got the side kick for it I can do bre... Very nice well built only used once but worked great I also got the side kick for it I can do breakfast lunch and dinner on this smoker better than more higher price smokers has a fire pot clean out and pellet clean out the higher price one you have to take the insides out to clean out with a shop vac. Rated 1 out of 5 by JD from Brand New Grill Never Finished 1st Smoke: The product started off good: fast delivery, easy to as... Brand New Grill Never Finished 1st Smoke: The product started off good: fast delivery, easy to assemble, felt sturdy and looked good. Unfortunately that is where everything good about the unit ended. 1 hour into smoking (1 hour is when I noticed) the unit stopped working, had no power and blew the fuse. Turns out what they call the "Hot Rod" (the heating element) had blown. Camp Chef customer service was horrible. They wouldn't even send me to the warranty department without providing name, address, phone number, proof of purchase and the unit's date code which shows when it was made. Once finally connected with the warranty department and the troubleshooting for the problem was complete, the warranty department would not send the replacement part until the all the same information that had been provided to talk to them in the first place. Plus I would have to fix the unit myself. Both departments seemed apathetic to the fact that dispite the unit being brand new it worked for one hour or less and they could not care any less about my worries on their product's quality and longevity. I returned the product and purchased a different brand. I definitely would NOT recommend this smoker or this brand. Rated 5 out of 5 by Scottsfishin from Absolutely Awesome Pellet Grill I have had my Pro Lux 36 for over a year now. It has been absolutely amazing! I use it at least 4 to 6 days a week and have had no issues at all. It smokes meat perfectly. Always juicy and tender. The flavor and smoke ring in my food are equal to that of any wood type smoker without the hassle. I also purchased the blanket since it gets pretty cold where I live. I have used my pellet grill well into the single digits with no problem. I also purchased the jerky rack system. Its great for jerky and I also use it for making pizza. That way the dough doesn't fall through the grate and I don't have to use a pan or a stone. It can absorb more of that wood fire taste. The jerky racks also let me make large amounts of smoked chicken wings! I usually make 60 or more at a time with no problems. Cleaning the grill is a breeze with the patented ash clean out system. After about 100 lbs of pellets burned, I take the the drip try out and vacuum out the bottom. It super easy. Cleaning the grate can be a little more difficult, but I just wash it with the hose after removing the heavy material. If you are looking for a pellet grill, this is the on to get! Rated 2 out of 5 by learning to smoke from Nice smoker but junk wheels and wheel locks Nice smoker but the wheels are extremely cheap and the wheels will not lock in place so it gets pushed around by the wind. One issue is the when smoking the ash goes everywhere inside the unit so keep a vacuum ready when you are cleaning up the smoker. You can't easily get the gate open to dump what little ash is left in the burn chamber. Designers need to look at a fix for these issues. You would think with a retail price over 1400 bucks with the sear box, cover and heat blanket for cold winter days; the wheels would be better quality or larger and the ash would stay in the burn area. It just a matter of time before the front small wheels give way to the weight of the unit from moving in and out of the garage. On a positive note, the garage makes you hungry every time you pull your car in with the residual smokey smell of the food you made prior. Rated 5 out of 5 by Anonymous from This is my third smoker and by far the best. My other smokers were offset smokers that required c... This is my third smoker and by far the best. My other smokers were offset smokers that required constant monitoring to maintain temp. This stove is a ‘set it and forget it’ smoker. This allows me to smoke pork butts and briskets overnight without losing any sleep. I can also change cooking temps with just a turn of a dial. Love the ash and grease buckets. Easy pellet changes. Just pull a lever and dump them into a bag/bucket, then add a different flavor pellet. Quick an easy. Practically no ash compared to charcoal or wood smokers. High recommend!! Rated 5 out of 5 by madmarc from I’ve cooked on it twice, so far. Easy to operate... I’ve cooked on it twice, so far. Easy to operate and cooked great. From ribs to hamburgers, they all came out great.